Coaching for Attorneys is an exciting new book by Certified Performance Coach, Cami McLaren (of McLaren Coaching) and Sacramento attorney Stephanie Finelli (Law Offices of Stephanie Finelli). As the title promises, this book will help busy attorneys increase productivity and attain balance in their practices and in their lives. 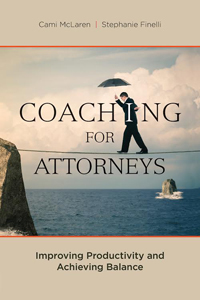 The book is styled as a coaching tool for attorneys. It contains the tools Cami uses in her business coaching attorneys. If you read the book and apply the tools/do the homework, you will see changes in your practice. You will learn to manage your time better and improve communication with staff and at home. You will learn to set and attain your business goals. You will learn the REALITY model of client enrollment – bringing them in and keeping them satisfied. The book is easy to understand and contains plenty of examples to help you apply the tools. Making change is simple but it is not always easy. Be ready to work–just like if you hired a coach!